After much anticipation, iTrade is bringing first-rate order management to regional and mid-size buying organizations. 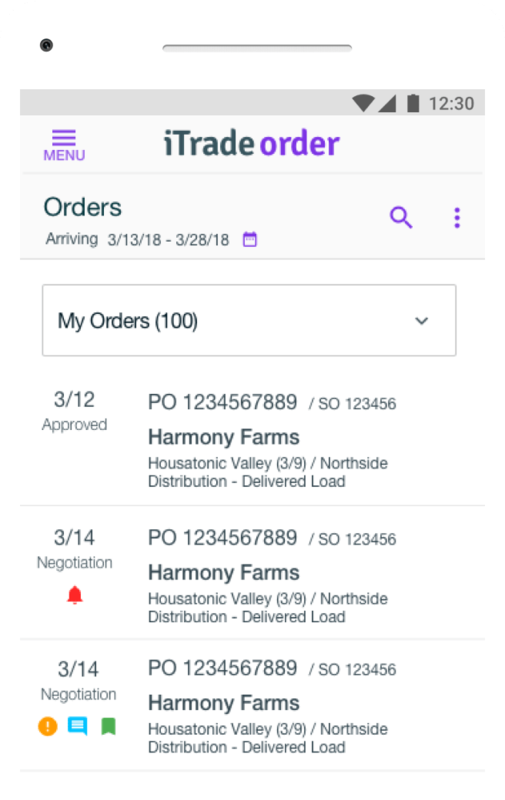 With collaborative workflows, mobile compatibility, a new UI, issue-based management, and self-service onboarding, iTradeOrder gives mid-market companies all of the features they need to simplify and streamline their order management processes. A strategic technology partner, not just a software solution. With a network of over 5,000 buyers and suppliers, OMS streamlines your entire procure-to-pay process, enabling you to trade with all of your trading partners using a single, collaborative platform. Whether you utilize EDI, are non-EDI, or leverage a VAN, iTrade’s OMS can meet your needs and complement your perishables trading operations. We understand the urgency of perishable order management. With issue-based management, automated alerts and customizable notifications, OMS saves you time and money by enabling you to make changes to purchase orders quickly and efficiently. In today’s market, mobility is essential. OMS Next-Gen offers a native mobile app for both Android and iOS, so that you can conduct your business whenever and wherever you need to. For perishables order management, item mapping is a must. iTrade creates a permanent map based only upon the buyer and seller product codes. Easily manage your orders by using a single catalog and SKU for 2, 5, or 20 different vendors. Onboard new vendors effortlessly. OMS has over 20 years of experience easily integrating with a variety of back-end systems and enterprise applications. Once you connect to OMS, no further integration is needed to connect with other trading partners on the network.